Zamioculcas zamiifolia or ZZ plant as most of us know it, is the sole species of the genus Zamioculcas. It is a tropical plant native to eastern Africa (from Kenya to South Africa) commonly found growing in rocky areas and sometimes even in stone. They can grow upwards of two and a half feet tall, with glossy dark evergreen leaflets covering their thick, succulent stalks. Although ZZs live in areas that experience a dry season and are drought tolerant, they are not desert plants and therefore do not thrive in extended periods of dryness. The secret to their ability to handle drought can be found in their succulent leaves, which have an unusually high water content of over 91%. This ability, combined with being able to withstand low light, has made them one of the most popular houseplants of the last twenty years. ZZs are also one of the top plants that NASA suggests using for air purification in the home. ZZs have a somewhat unusual growth pattern. Their stem is actually an underground, tuberous rhizome, capable of storing plenty of water during the dry season. What appears to be the stem is actually the entire leaf, with each “leaf” being a leaflet. During times of stress and extended dry periods ZZs tend to become deciduous, dropping their leaflets and becoming bare. As a survival method fallen leaflets can then root, essentially cloning the plant and ensuring future generations. 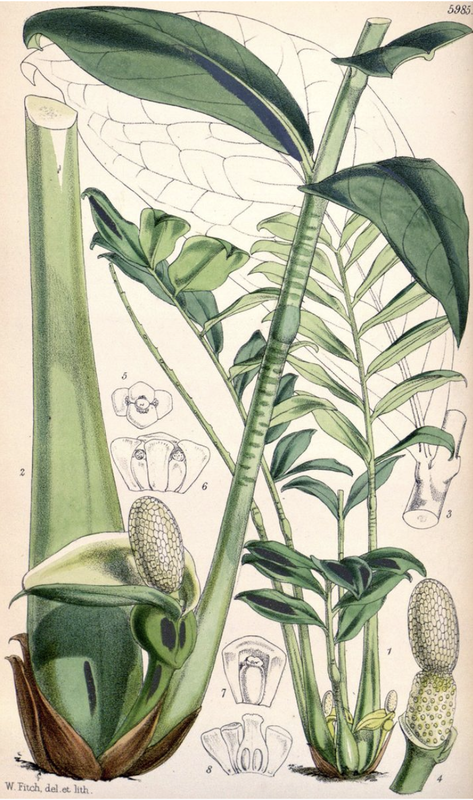 ZZs are aroids and therefore do not produce a single flower, but rather an inflorescence made up of a spathe and spadix consisting of many tiny flowers (think of the flower on a peace lily). The spadix is made up of female flowers along the bottom portion and male flowers along the top with a section of sterile flowers in the center to help reduce the chances of self-pollination. Although no one knows for sure, it’s assumed that the ZZ is pollinated by a single species of insect. ZZs are very easy to care for and incredibly resilient, which is one reason why they’ve become so popular as houseplants over the past 20 years. Although they’ve developed a reputation for being drought and low-light tolerant plants, it’s not advised to keep them in these conditions for extended periods of time. Your ZZ will thrive in a warm room (60-75 degrees) with bright, indirect light and regular waterings throughout the growing season (spring-fall). Allow the top few inches of soil to dry between waterings. Even though they’re tropical, a well-draining soil heavily amended with sand and perlite is best. This will allow enough air to get to the roots and prevent the plant from drowning. Being tropical, give your ZZ a mist as often as you can and wipe off its leaves to remove any dust that may build up. To fertilize, dilute a balanced liquid fertilizer to ¼-⅛ strength and add to your water. ZZs propagate very easily from their leaves, but may take several months to develop a small plant at the base. When repotting, try to keep the new pot around 1” larger than the current pot. ZZs prefer to be fairly pot bound and some growers will even wait until their pot has cracked before repotting.